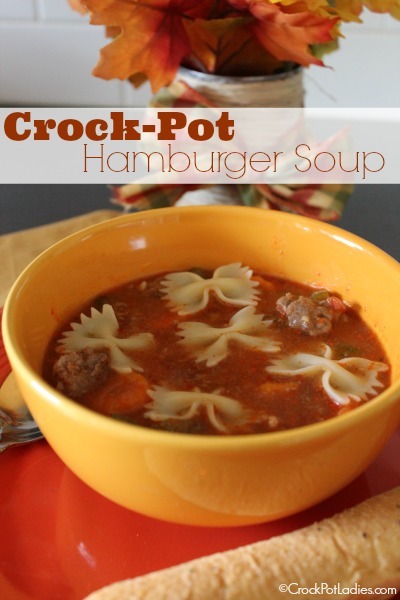 Are you looking for a delicious yet frugal crock-pot recipe? 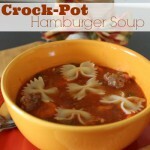 If so then you cannot go wrong with this Crock-Pot Hamburger Soup recipe. It is the perfect thing to serve on a cold day with a side of crusty bread to dip into the juices. Yum! First start by gathering your ingredients: ground beef, onion, carrots, celery, diced tomatoes, beef base, oregano, salt, pepper, garlic, Worcestershire sauce & pasta. 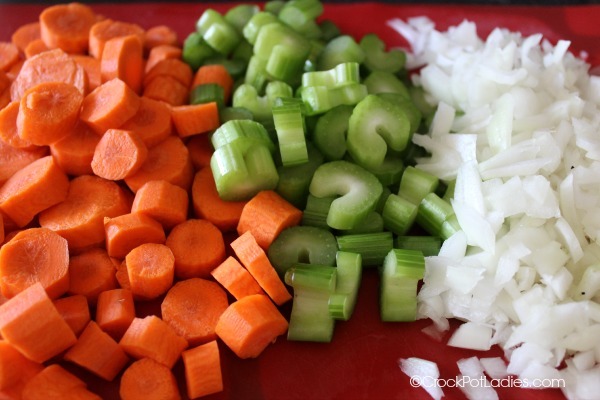 Next chop your carrots, celery and onion. 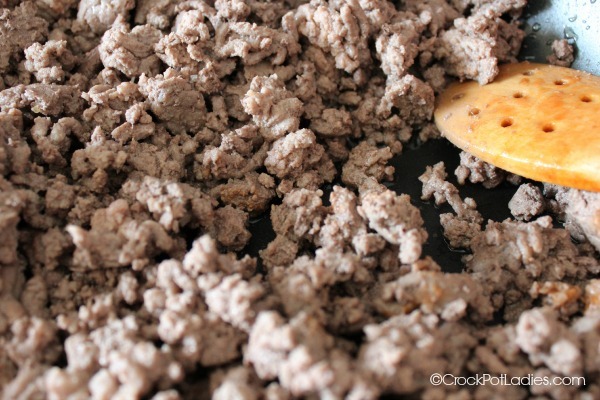 Brown your ground beef in a skillet and drain off any grease. I like to rinse my ground beef to remove even more of the fat. And then you simply dump the rest of the ingredients (except the pasta) into your crock-pot and cook on LOW for 8 hours or HIGH for 4 hours. Toss in some cooked pasta at the end and you got dinner on the table! Brown your ground beef in a skillet and drain grease. 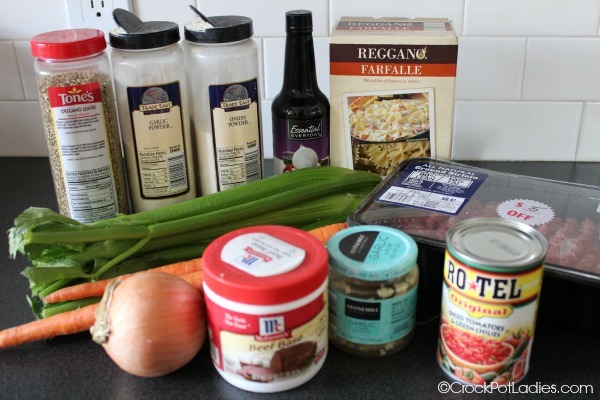 Combine all remaining Ingredients except for pasta into 5 quart or larger Crock Pot. Cook Pasta and add to dish before serving. Optional: Sprinkle Parmesan Cheese on top for additional flavor. It’s in the crock-pot now (I replaced the canned tomatoes with pureed pasta sauce for my picky “no tomato chunk” family). I know some folks dislike chunks of tomatoes. Your solution sounds good. How did the soup come out Laura? This is in the crock pot right now! It smells delicious! The only thing I did different, is I omitted the beef base because I am allergic to MSG. I’m having trouble finding one without it. So instead of adding the water, I added 2 cups of Swanson No MSG beef broth. I hope it turns out! I can’t wait to try it! 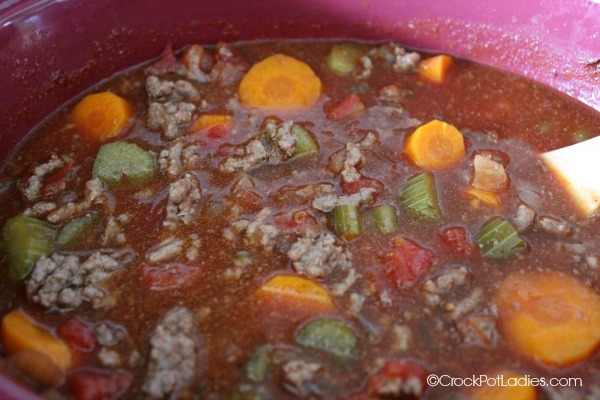 I want to make your hamburger soup recipe but I have a newer crock pot that seems to cook much more quickly than my old crock pot. I’m worried that if I cook for 8 hours it will be overcooked. Any suggestions on how to adjust the time for the newer pot? I would cook it on low for at least half the time. So 4 hours. But check it at 2. I have a crock-pot that cooks higher than normal too. How long do you suggest cooking the pasta for al dente? For this recipe you cook your pasta on the stove-top and just follow the directions on the package. I usually cook mine about 10 minutes or so and just test for when it get to al dente. Then you add the cooked pasta to the soup. This was so yummy. I made it today but had to add just a little bit more broth in it. I ate until I was about to pop. Great for a Cold day like today. Thanks for your comment Debra. This soup is definitely a good one for cold winter days! I made this soup today and I followed the recipe exactly but for some reason it came out more like a chili then soup. Any suggestions for when I make it again? You may need to add more water to your soup. I would start with 1 or 2 cups of water and stir it around and see if it is more the soup consistency you like. However unless you tried cooking your pasta in the soup it shouldn’t come out thick like chili. Just made this soup and is in my crockpot now. I was wondering if 2 cans of tomato paste is too much? I saw the comment from Brenda who said she followed the recipe and it came out more like a chili then soup. I noticed in the picture you don’t have tomato paste or in the first set of directions. The paste is only in the recipe at the end of the blog. I added a little more beef broth to make it more soupy like because mine too was pretty thick. Can’t wait to try it tonight!!! Making this now! I adjusted and added 1 cup beef broth and 2 cups of water to it, instead of the 2 cups of water. It looked a little thick to start but once the crock pot simmers it for a few, it should be great! Trying this recipe right now! Smells amazing and the little taste tests I keep doing are so yummy. I also used beef broth instead of water and added a little extra cuz I had a lot of veggies and meat, def looked like it was gonna really thick. Lol! I was wondering if ud think adding in barley would be a good idea? Closer to the end maybe so it doesn’t get to thick? I’m trying it with the noodles tonight first though. Thank you for sharing this recipe!! Great tip Don, thanks for sharing! This didn’t seem like much of a soup for me (thick! ), so I served it over spaghetti. Nevertheless, it was yummy. Is this right? 16 ounces of tomatoe paste, that’s 2 cups. Never have I uses this much in any soup or sauce. Thanks Joanne for catching that. I just double checked my recipe notebook and the my notes say 6 ounces of tomato paste. Not 16. I have gone ahead and edited the recipe to reflect the correct amount of tomato paste. in the winter it is hard to get good fresh vegetables in Canada. I use a whole package 1 Kg package of flash frozen vegetable mixes. There are many different choices available. Asian or Thai, or California for example. I follow the rest of the recipe but used beef broth instead of water. I made this with ground turkey instead and was great. Followed the recipe and in the end added about two more cups of water because it wasn’t soupy at all. I also added some zucchini and spinach to the veggie mix. My 5 year old daughter loved it but was a bit too spicy for her. I’ll swap out the tomatoes with chilies next time for the kids. I also didn’t think it needed a whole tablespoon of salt. I’ll try half that at most next time.